The Cardinals and Onaway faithful celebrate Onaway's victory at the Presque Isle County Tournament. 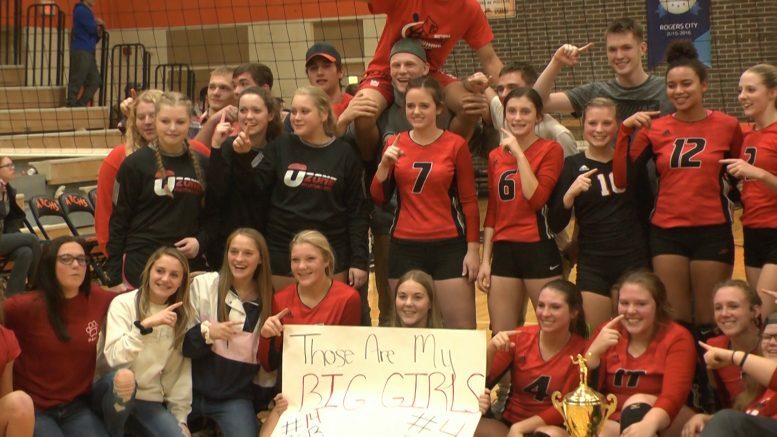 ROGERS CITY — Rogers City High School hosted the annual Presque Isle Championship volleyball tournament Wednesday. The winner is given a trophy to hold until next year’s tournament to honor the best team in Presque Isle county. The Rogers City Hurons, Posen Vikings, and Onaway Cardinals all participated in the event. The first match was between Rogers City and Posen. The Hurons defeated the Vikings in both tournament sets and a consolation set 25-17 and 25-11. The Vikings then faced the Cardinals. Onaway won the first set 25-15 and the second set 25-12. The championship match was then held with the Hurons facing the Cardinals. Both teams have solid fundamentals and high powered offenses. Taylor Flemming, Krysten Altman, and Catheryn Hart have been catalysts for Rogers City this season, while Onaway boasts Kennedy Crawford, Calley Selke, and Breya Domke. Onaway had the edge over Rogers City in the first set winning 25-17. The key for Onaway was the lack of defensive errors and their ability to find openings in the Huron defense. Rogers City came back to win the second set 25-18. Flemming’s play was particularly strong, but the Hurons spread the ball out to multiple hitters and ran multiple plays to spread out their offense. Set 3 saw the Cardinals take an early lead. They led 8-2 thanks to a Mallorie Neelis 7-0 serving run. In a set to 15, it’s very hard to comeback from a deficit that large. But the Hurons were determined to make this one a heart pounder. Rogers City pulled within one to make the score 13-14, but they were called for playing the ball on an unoccupied court to give the Cardinals a 15-13 win and the Presque Isle County trophy. Onaway plays Monday in the first round of districts at home. Posen travels to Atlanta for the first round of their regional. Rogers City has a conference tournament Saturday morning in Oscoda, and will then face the winner of Johannesburg-Lewiston vs. East Jordan in Charlevoix on November 1st for their district match.